Section of bluff trail bordered by trees. Earl Grey Park, southwest Calgary. November first. 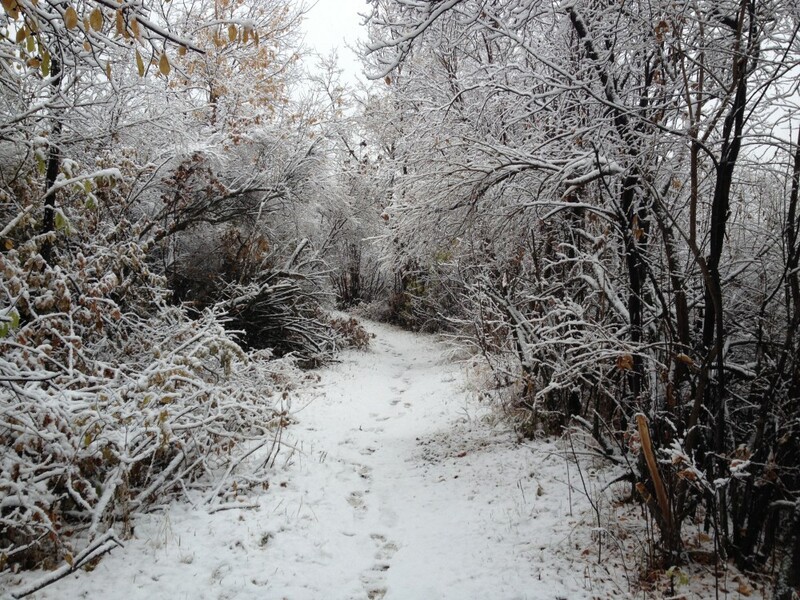 First Calgary snowfall since “Snowtember”. BIG snowflakes around 3 pm. Exciting! Since I spent yesterday looking at pictures of Earl Grey Park and its foliage changes through September and October, I thought it would be totally awesome to go see what it looked like today, while those big snowflakes were falling. So I left the house right away, before the weather warmed up and the snowflakes got smaller and wetter and turned to rain. There are pictures of the park in September and October in this post. Big snowflakes from stairwell window. Large, grassy area of park. Stand of aspen trees, which was bright yellow a few weeks ago, is on the left. View from top of stairs. Halfway down the stairs, there is a little trail which traverses the bluff. I decided to mosey along the trail. Section of trail bordered by trees. A little rabbit shot across the trail right in front of me! Trail section in the trees, looking back. Wooded trails in big cities make me giddy with delight!